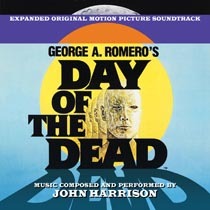 The 323rd Soundtrack of the Week is John Harrison's score for George Romero's Day of the Dead. Day of the Dead is the least of Romero's excellent zombie trilogy but it's still better than almost any zombie story that came after it. Harrison's score mixes synth textures with propulsive rhythms, a recurring wistful theme and even some wailing electric guitar that might remind you of music from Miami Vice. This release contains the original soundtrack recording as well as the album release, which has two songs performed by Sputzy Sparacino. The music in general is surprisingly pleasant with patches of tension and menace. It's nice to listen to on a cloudy day.